From the handbook of the Ruhleben Football Association Season 1915, Paul O' Brien is noted as being from Cardiff, and as having been born in Craigendaich in July 1897. He was a seaman, and was arrested in August 1914 in Hamburg, and after a brief imprisonment in the city was sent to Ruhleben, where he was interned in Barrack 4. James O' Connor was one of six prisoners released from Ruhleben in October 1917, who made their way to Rotterdam to proceed to England, as reported in The Times of October 5th 1917 ("Imperial and Foreign News", p.7, col. F). The National Archives in London hold documents from 1915 at FO383/27 regarding marine engineer Charles O'Donnell, namely enquiries from his local MP for his release, as his wife and nine surviving children need assistance. From Marcus Bateman's merchant seaman website, we learn that Charles was in fact was first engineer on the 'Treria', and was originally from 574 Hawthorne Road, Bootle. He was one of a group of Ruhleben inmates released on March 6th 1918 to England, as noted in files at the National Archives in Kew under accession number MT9/1238. Throughout his stay he was interned in Barrack 4. T. O' Neil was recorded as a member of the Ruhleben Lancastrian Society in the Manchester Guardian of January 15th 1915 (p.12). The article is entitled "Interned in Germany: Lancashire's Civilian Prisoners: Full List of Those Detained at Ruhleben". His address was recorded as 25 Burlington Street, Liverpool. Stanley Leslie O' Neill is listed in the surviving register from Barrack 5 at Ruhleben (register number 2), recorded by Neville Stanley Wilkinson in approximately 1916. In the register, O' Neill is recorded as having been born on April 1st 1893 in Wadsley Bridge, and is described as having been a student prior to his internment. His home address was listed as Balliol College, Oxford. At the time the register was recorded, O' Neill was noted as staying in loft A, having transferred there from Barrack 8 on November 9th 1915. D. Obridge is noted on a list of prisoners of war on a document entitled 'Men in Englander Lager, Ruhleben', held by Hull Local Studies Library (provisional catalogue entry: Hohenrein Collection F 10b), supplied by senior local studies librarian David Alexander Smith in July 2008, for which I am grateful. The document notes that Obridge was a merchant seaman on board the Duke of Wellington, and interned in Barrack 17. Alfred Ogden is listed in the surviving register from Barrack 5 at Ruhleben (register number 2), recorded by Neville Stanley Wilkinson in approximately 1916. In the register, Ogden is recorded as having been born on May 9th 1886 in Nelson, Lancashire, and is described as having been a teacher prior to his internment. His home address was listed as 50 Westmoreland Street, Nelson, Lancashire. At the time the register was recorded, Ogden was noted as staying in box 12. He was later sent to Stadtvogtei on September 1st 1917. Ogden was recorded as a member of the Ruhleben Lancastrian Society in the Manchester Guardian of January 15th 1915 (p.12). The article is entitled "Interned in Germany: Lancashire's Civilian Prisoners: Full List of Those Detained at Ruhleben". From the handbook of the Ruhleben Football Association Season 1915, Ogden is noted as being from Nelson, Lancashire, and as having been born in Nelson in 1886. He worked as a schoolmaster in Marburg, where he was arrested on 5 AUG 1914. After a brief period held in Marburg, Cassel and Berlin, he was sent to Ruhleben, where he was interned in Barrack 5. George E. Oldroyd is listed in the surviving register from Barrack 5 at Ruhleben (register number 2), recorded by Neville Stanley Wilkinson in approximately 1916. In the register, Oldroyd is recorded as having been born on August 12th 1897 in Sagan i/ Schles, and is described as having been a scholar prior to his internment. His home address was listed as Calaner Str 11, Kottbus i/S. At the time the register was recorded, Oldroyd was noted as staying in loft A, having transferred there from Barrack 1 on April 19th 1915. He later moved to the Tea House on October 17th 1917. S. Oldroyd was noted in The Times of December 8th 1915 as having been one of the 160 prisoners released from Ruhleben on the previous day who had travelled by train to Flushing ("Returning Civilians" p.9, col.F). A. Oman is noted on a list of prisoners of war on a document entitled 'Men in Englander Lager, Ruhleben', held by Hull Local Studies Library (provisional catalogue entry: Hohenrein Collection F 10b), supplied by senior local studies librarian David Alexander Smith in July 2008, for which I am grateful. The document notes that Oman was a merchant seaman on board the Coralie Horlock, and interned in Barrack 11, loft. B. Openfield's signature was recorded by fellow internee Christopher Cornforth in an autograph book which is now held at the Imperial War Museum. Openfield was interned in the loft of Barrack XI, and his home address was recorded as 4 Plowden (?) Road, Cricklewood. Sketches by Ruhleben internee Cyril Oppler were included in an auction at Boulton and Cooper Fine Arts, in the north of England, on September 17th 2008. Oppler's sketches were included in a sketchbook belonging to prisoner John McLaren (many thanks to Fine Arts representative Helen). George Opler was listed in The Times of January 8th 1916 ("Released Civilians" p.5, col. D) as one of 69 men released from Ruhleben on Thursday, January 6th, 1916, who subsequently travelled to Flushing for their return trip to England. Oppler's tragic end is recalled in "The Ruhleben Prison Camp: A Record of Nineteen Months Internment", which was later reprinted as a part of "The Ruhleben Prisoners: The Case for their Release" in February 1917" (p.13). Another (Mr. Oppler), who was released earlier (ie than Jan 1916), died in September, 1916, after several months detention in Colney Hatch. Many thanks to Jim MacKay for providing this information in December 2007. The National Archives in London holds documents from 1915 at FO383/37 concerning Edwin Oppé, a naturalised British subject interned at Ruhleben. The documents concern the discontinuance of his relief, and a request that relief be continued to his children. John Orgill was listed in The Times of January 8th 1916 ("Released Civilians" p.5, col. D) as one of 69 men released from Ruhleben on Thursday, January 6th, 1916, who subsequently travelled to Flushing for their return trip to England. G. Orless was noted on a postcard dated 27 JAN 1917 as being in Barrack 12; the card is now owned by Dr. Manfred G. Heber of Grand canaria (with thanks to Dr. Heber). Samuel Orme was one of sixteen men released from Ruhleben in January 1917, as reported in the Times of January 29th 1917 ("Changed Conditions in Germany", p.8, col. G). He is described in the article as being from Port Sunlight, and as having been adopted in the camp by a resident of Gravesend. He was a cook on a small vessel sunk by the Germans on August 26th 1914, and was taken prisoner, along with the other eight members of the crew. They were landed initially at Wilhelmshaven, sent to Emden and then to Sennelager. At Sennelager "he had the indignity of being turned into a sort of Merry Andrew, by having one half of his moustache shaved off and the hair of his head on the other side". He also claimed that the German soldiers at Ruhleben would starve if it was not for the prisoners' food parcels. David Orrell was noted in the seventh issue of In Ruhleben Camp (Sep 1915, p. 44) as a cobbler, working at "The Shoemaker's Shop, Bond Street. W". "The Camp Carpenter, Mr. Osborne, although working from morning till night, does his work quite voluntarily, only being allowed his dinner from the Casino". NB: This may be the Osborne noted above. From Marcus Bateman's website we learn that Ralph was released from Ruhleben on March 6th 1918, as noted under file MT9/1238, helad at the National Archives in Kew. The file also tells us that he was interned within Barrack 8. James Oswald is noted as having been in Barrack 16 on a letter dated 6 JAN 1916, a photocopy of which is held by Dr. Manfred G. Heber of Grand Canaria (with thanks to Dr. Heber). From a photo of a National Archives file from collection MT9, supplied by Marcus Bateman in March 2007, it is known that on November 30th 1916, Friedrich Ottens, who had been allowed to go on leave from the camp to visit Rosebruch, returned to the Ruhleben barrack within the Tea House. (Camp Changes, Supplement 10). On the following day, December 1st, he was once again given leave to visit Rosebruch, near Rothenburg, until further notice. Many thanks to Marcus. A. S. Ovens, of Erith, Kent, was named in a list of merchant seamen interned at Ruhleben, as published by the Scotsman newspaper on 7/1/1915 (p.7). F. T. Overman was recorded as a member of the Ruhleben Lancastrian Society in the Manchester Guardian of January 15th 1915 (p.12). The article is entitled "Interned in Germany: Lancashire's Civilian Prisoners: Full List of Those Detained at Ruhleben". His address was recorded as c/o Overman and Co., 38 Cooper Street, Manchester. The National Archives in London hold documents from 1915 at FO383/78 regarding payments made on behalf of Oskar J. Overwag, a British subject interned at Ruhleben, in a lawsuit, from British Relief Funds. The National Archives in London hold documents from 1916 at FO383/208 regarding Arthur Owen, formerly a crew member of the SS Zealand, consisting of several enquiries from his wife regarding his health, including confirmation that Owen had been moved to Dr Weiler's Sanatorium, the report of the death of Owen, a request by his widow for a copy of the death certificate, a request by his widow for the return of her husband's personal effects, the return of the personal effects of Owen and Captain Charles Fryatt, and a copy of Owen's death certificate (in docket no. 254427). From Marcus Bateman's website on merchant seamen POWs, Owen's address at the time of his arrest was noted as 109 Crawford Avenue, Sefton Park, Liverpool, and that he was the third engineer. Owen was also recorded as a member of the Ruhleben Lancastrian Society in the Manchester Guardian of January 15th 1915 (p.12). The article is entitled "Interned in Germany: Lancashire's Civilian Prisoners: Full List of Those Detained at Ruhleben". His address was recorded as above. David Owen was mate of the George Casson, interned at the age of 22. The Welsh Mariner's Index and Marcus Bateman's "Index of British Fisherman and Merchant Seamen taken Prisoner of War 1914-1918" both note that Owen's home residence was 10 Osmond Lane in Portmadoc. "He (Owen) was a football player and played in a game where a cup was presented at Ruhleben. Recently I have found out this cup is in the possession of a distant relative." It is therefore likely that David is the Owen noted in the fifth issue of the Ruhleben Camp Magazine (Christmas 1916, p.58) as having played for the winning Cameron's XI side against Brearley's XI on October 7th 1916. The score was 4-2 to the Cameron team. An 'Owens' was also noted as playing on the Rest of the World side, led by Cameron, in a mock international between England and the Rest of the World on May 2nd 1915. Kick off took place at 4.30pm, and a document with the teams listed was recently discovered amongst some Foreign Office files by the National Archives, in November 2005. George Edge Owen was recorded as a member of the Ruhleben Lancastrian Society in the Manchester Guardian of January 15th 1915 (p.12). The article is entitled "Interned in Germany: Lancashire's Civilian Prisoners: Full List of Those Detained at Ruhleben". His address was recorded as 5 Rectory View, Heaton Park. Harold Percy Owen is listed in the surviving register from Barrack 5 at Ruhleben (register number 2), recorded by Neville Stanley Wilkinson in approximately 1916. In the register, Owen is recorded as having been born on August 26th 1893 in Clipstone, and is described as having been a correspondent prior to his internment. His home address was listed as "Sunnyside", Coventry Road, Market Harborough. At the time the register was recorded, Owen was noted as staying in box 27. On May 23rd 1918 he was given indefinite leave from the camp. Between January 12th 1918 and January 24th an H. Owen was noted as having been in the Schoningsbaracke - this may have been Harold, or possible Herbert Owen. From the handbook of the Ruhleben Football Association Season 1915, Owen is noted as being from Sunnyside, Coventry Road, Market Harboro, and as having been born in Clipstone in 1893. 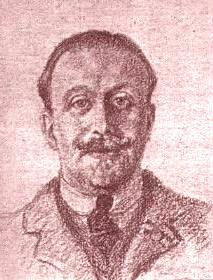 He worked as a foreign correspondent in Cologne, and was arrested on 8 AUG 1914. After a brief period held in Sennelager and Cologne, he was sent to Ruhleben, where he was interned in Barrack 5. Herbert Owen is listed in the surviving register from Barrack 5 at Ruhleben (register number 2), recorded by Neville Stanley Wilkinson in approximately 1916. In the register, Owen is recorded as having been born on August 20th 1879 in Bolton, and is described as having been a fitter prior to his internment. His home address was listed as 12 Ainsdale Street, West Gorton, Manchester. At the time the register was recorded, Owen was noted as staying in loft A.
Owen was recorded as a member of the Ruhleben Lancastrian Society in the Manchester Guardian of January 15th 1915 (p.12). The article is entitled "Interned in Germany: Lancashire's Civilian Prisoners: Full List of Those Detained at Ruhleben". Between December 22nd and December 27th, Owen spent some time in the camp's Schonungsbaracke. (An H. Owen was also noted as having been in the Schoningsbaracke between January 12th 1918 and January 24th, though this may have been Harold Owen, rather than Herbert.) Herbert relocated to Holland on April 25th 1918. The National Archives in London holds documents from 1915 at FO383/39 regarding the treatment of Mr. Owen, first engineer of the steamer Royal recently returned from Ruhleben, in an account written by his wife, Mrs. A. Owen of Portmadoc. From Marcus Bateman's Index of British Fishermen and Merchant Seamen taken Prisoner of War 1914-1918, some further information has also been gleaned. Thomas address at the time is given on the site as Gwen Fa, Llanrug, Carnarvonshire, and that he was born in 1879. W. Owen was recorded as a member of the Ruhleben Lancastrian Society in the Manchester Guardian of January 15th 1915 (p.12). The article is entitled "Interned in Germany: Lancashire's Civilian Prisoners: Full List of Those Detained at Ruhleben". His address was recorded as 77 Burleigh Road South, Liverpool. From the handbook of the Ruhleben Football Association Season 1915, as William Owens he was noted as being from 77 Burleigh Road, South Liverpool, and as having been born in Liverpool in 1883. He worked as a carpenter and was arrested in Hamburg on 16 OCT 1914. He was confined initially to the hulks in Hamburg, before being sent to Ruhleben, where he was interned in Barrack 8. Marcus Bateman's site confirms these details from files in MT9/1238 at TNA, and notes that Owens was a carpenter on the Zealand. G. A. Packe co-authored an article, with E. D. Ripley, on the state of the Ruhleben Tennis Association, for the fourth issue of the Ruhleben Camp Magazine (August 1916, p.45). Packe was thanked for articles written for the Ruhleben Camp Magazine by its editor, C. G. Pemberton, in the fifth issue (Christmas 1916, p.62). The Imperial War Museum in London holds many pohotographs from Ruhleben under the Packe G. A. Collection, accessible at ID: 1003-05 Q 103591 - Q 103599. George Page was noted in the Football section of the fifth issue of the Ruhleben Camp Magazine (Christmas 1916, p.58) as being responsible for the football ground, along with two other inmates, Sam Coles and Ted Hearn. Tom Paine was recorded as a member of the Ruhleben Lancastrian Society in the Manchester Guardian of January 15th 1915 (p.12). The article is entitled "Interned in Germany: Lancashire's Civilian Prisoners: Full List of Those Detained at Ruhleben". His address was recorded as c/o Messrs. Mandlebergs Ltd., Pendleton. Palin was noted as playing on the England side, led by Steve Bloomer, in a mock international between England and the Rest of the World on May 2nd 1915. Kick off took place at 4.30pm, and a document with the teams listed was recently discovered amongst some Foreign Office files by the National Archives, in November 2005. William Palmer was a British horse trainer working in Hoppegarten, who was interned in Ruhleben at the beginning of November 1914, as noted in the Scotsman newspaper on 9/11/1914 (p.9), and in The Times of the same day ("British Interned in Germany", p. 7, col. E). The Scotsman noted on 30/11/1914 (p.9) that he was released from the camp two days prior, on the 28th. He was released because many thoroughbreds had been left on their own in their stables, and had soon gotten out of control. The Germans therefore deemed it wiser to release their trainers than to have them remain interned. Harold Parkinson is listed in the surviving register from Barrack 5 at Ruhleben (register number 2), recorded by Neville Stanley Wilkinson in approximately 1916. In the register, Parkinson is recorded as having been born on August 13th 1878 in Garstang, Lancashire, and is described as having been an engineer on the "Nicoya" prior to his internment. His home address was listed as 73 Knoclaid Road, Liverpool. At the time the register was recorded, Nash was noted as staying in box 8, having transferred there from Barrack 13 on November 27th 1916. Parkinson was also recorded as a member of the Ruhleben Lancastrian Society in the Manchester Guardian of January 15th 1915 (p.12). The article is entitled "Interned in Germany: Lancashire's Civilian Prisoners: Full List of Those Detained at Ruhleben". His address was recorded here as 217 Lisbon Lane, Clubmoor, Liverpool. Parkinson is also recorded as having gone to the Lazarett on June 18th 1918, although no date is noted as to a departure from there. Joseph Parkinson was first engineer on the 'Manx Queen', and was originally from 112 Hildyard Street, Grimsby (Many thanks to Marcus Bateman.) He was one of a group of Ruhleben inmates released on March 6th 1918 to England, as noted in files at the National Archives in Kew under accession number MT9/1238. Throughout his stay he was interned in Barrack 9. Parkinson is also noted on a list of prisoners of war on a document entitled 'Men in Englander Lager, Ruhleben', held by Hull Local Studies Library (provisional catalogue entry: Hohenrein Collection F 10b), supplied by senior local studies librarian David Alexander Smith in July 2008, for which I am grateful. The document notes that he was a merchant seaman on board the Manx Queen, and interned in Barrack 9. Reginald A. Parkinson was chief officer on the 'Campeador', and was originally from 14 Canton Street, Popular E, Middlesex. He was one of a group of Ruhleben inmates released on March 6th 1918 to England, as noted in files at the National Archives in Kew under accession number MT9/1238. Throughout his stay he was interned in the Tea House. Many thanks to Marcus Bateman. W. H. Parkinson was noted on a list of prisoners of war on a document entitled 'Men in Englander Lager, Ruhleben', held by Hull Local Studies Library (provisional catalogue entry: Hohenrein Collection F 10b), supplied by senior local studies librarian David Alexander Smith in July 2008, for which I am grateful. The document notes that Parkinson was a merchant seaman on board the Coralie Horlock, and interned in Barrack 9, box 7. A. Parr was noted in the second issue of In Ruhleben Camp (June 1915, p.28) as having played the part of Audrey in "As You Like It", produced by Duncan-Jones and Leigh Henry through the Ruhleben Dramatic Society. Parr was recorded as a member of the Ruhleben Lancastrian Society in the Manchester Guardian of January 15th 1915 (p.12). The article is entitled "Interned in Germany: Lancashire's Civilian Prisoners: Full List of Those Detained at Ruhleben". His address was recorded as 42 Great Mersey Street, Liverpool. D. E. Parr was noted in The Times of December 8th 1915 as having been one of the 160 prisoners released from Ruhleben on the previous day who had travelled by train to Flushing ("Returning Civilians" p.9, col.F). Professor Ernest W. Patchett was an inmate at Ruhleben, as noted by Francis Gribble in his essay entitled "Leaves From a Ruhleben Notebook". "In the latter, Professor Patchett, whom the Germans had picked up while he was on his way from a chair at Kingston, Ontario, to a chair at Southampton, was instructing the elect in the language of the Goths, in the poetry of Goethe, and in the philosophy of Kant and Hegel." The Liddle Collection at Leeds University holds a few items relating to Patchett's stay at the camp, under reference RUH 39. These are two postcards; and a transcript of a lecture entitled 'Religion & Life', delivered before the Arts and Science Union at Ruhleben on February 11th 1915. Patchett was also named as having chaired a Shakespeare Evening in IRC issue 7, p.8 (Sep 1915). In the same issue, an article on the camp's school describes him as Prof. E. W. Patchett B.A. (Cantab), and states that he had just resigned a professorship at Kingston (Canada) to take up a similar position at Southampton College, London University (p.17). From the handbook of the Ruhleben Football Association Season 1915, Adam Paterson is noted as being from Edinburgh, where he was born in August 1888. He was an engineer, and was arrested 9 SEP 1914. After a brief period held in Danzig, Butow and Stein, he was sent to Ruhleben, where he was interned in Barrack 4. 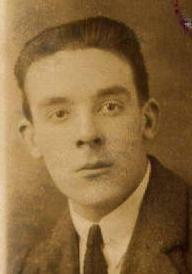 John Paton was interned in Ruhleben in 1916, after turning 18 years of age. His arrest in Brussels was made shortly after the tragic death of his father David Hepburn Paton, a Scottish shoe shop manager who had been in hiding in Brussels from the Germans for some time, after his refusal to hand over the account books from his shops to the occupying administration. It would seem that John was arrested in Brussels in November 1916 and transported to the Stadtvogtei prison in the city. On December 1st 1916 he was then moved to Ruhleben, where he was interned in Barrack 4. Family tradition has it that he was successfully treated after his arrest for a lung condition by the Germans, although it is not not if this was in Brussels or in Berlin. John remained in Ruhleben until the end of the war. For more on John, the History of the Perthshire Patons family history website outlines his complete life story. My great uncle John Paton (seated), to whom this site is dedicated, as an internee at Ruhleben. "Gustav Ginsberg, was a musician. His son recalled, many years later, that the internees were housed in converted stables and were treated reasonably there. At Rühleben, Gustav was very active in the camp orchestra. Other very good musicians interned there including the pianist Max Pauer… They played all the great piano concertos and put on performances of Gilbert and Sullivan in which men had to play the female roles, as there were no women in the camp." W. Pauer was noted in the second issue of In Ruhleben Camp as having been voted onto the committee of the newly formed Ruhleben Music Society, at a meeting on Thursday June 15th, attended by some 36 musicians in the camp (p.11 & p.41). "An element of trovelty has been lent to the Orchestral Concerts by the first appearance of two new conductors in the perosns of Mr. Quentin Morvaren and Mr. W. Pauer. Mr. Morvaren is an energetic young man who believes in doing nothing by halves - whether engaged in bringing Sullivan up to date, or in the arrangement of an orchestral concert, he may be relied upon to give his listeners a fll measure of interest, with possibly a mild shock as well. Other conductors have made severe demands on the necessarily limited powers of our Camp Orchestra, but in asking it to tackle a work such as Max Reger's "Ballet Suite", Mr. Morvaren was expecting it to achieve the impossible. The work, which may be taken as representing the composer in lighter vein, is nevertheless heavy enough, and is copiously strewn with those intricacies of part-writing and rhthm which are the toy of Reger's admirers and an offence to those who love him not. In any case, it needs extraordinarily finished playing if it is to sound at all well. The fact that the performance, in spite of some grotesque cracklings from the woodwind, was such as to give a very fair idea of the work as a whole, is in itself a very fine tribute to the splendid musicianship of Mr. Morvaren, as well as to the untiring zeal with which he and the members of the orchestra devoted themselves to the work of rehearsal. Mr. Pauer - less ambitious than Mr. Morvaren - presented nevertheless a very interesting and well-chosen programme, which included, among other works, Bach's Brandenburg Concerto in G, of which a well-balanced and spirited performance was given, Mozart's Overture to "Don Giovanni", quite excellently played, and the Morris Dance, Shepherd's Hey, "dished up for room-music twelvesome" by Percy Grainger. The interest of the Programme and the general excellence of the renderings entitle this concert to a high place among Ruhleben musical events. "Much good work has been accomplished in the Chamber Music evenings. Two unfamiliar works have been brought to a hearing - the noble and gracious Sonata in E flat. of Brahms, for Viola and Pianoforte,a choice example of the composer's ripest period of creative activity, played with fine feeling by Messrs. J. Peebles Conn and W. Pauer; and Dvorak's Terzetto for two violins and viola, an engaging little work, played with excellent ensemble and understanding by Messrs. Peebles Conn, T. H. Marshall and Leslie Harris." G. A. Payne was noted as being in the loft of Barrack 11 on 'Le Controleur' dated 16 FEB 1916, as held by Dr. Manfred G. Heber (with thansk to Dr. Heber). The National Archives in London hold documents from 1915 at FO383/26 on the Reverend C. J. Pearce, a British clergyman interned at Ruhleben. Documents include the refusal of the German Government to release him, and further representations from his father, William Pearce of Cardiff. Pearce was also noted in the same issue as being a member of the Ruhleben Dramatic Society (p.19), and on page 28 was noted as having played the part of Touchstone in the play "As You Like It", produced by Duncan-Jones and Leigh Henry, through the Ruhleben Dramatic Society. 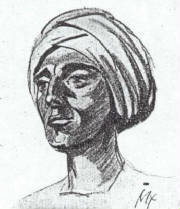 In the third issue of In Ruhleben Camp (July 1915, p.19), Pearce was sketched as he appeared in the role of Ali in the camp's production of "The Speckled Band". See right. In the first issue of the Ruhleben Camp Magazine (March 1916, p.16), Pearce was noted as having given a lecture entitled "Trade Unionism" to the M.E.A. Circle. He was also noted as having given a reading at a recent Thackeray evening held by the Debating Society in the camp (p.22), and of having contributed to a debate entitled "That the Abolition of Trade Unions would not be to England's Benefit", with Pearce arguing for the motion. Pearce was also thanked in the fifth issue of the Ruhleben Camp Magazine (Christmas 1916, p.37) for his contribution to the theatre during 1916. In issue six of the Ruhleben Camp Magazine (June 1917) Pearce was further recorded as having produced the play "A Pair of Spectacles" whilst in the camp. Pearson was released from Ruhleben in January 1917, as reported in the Scotsman newspaper on January 31st 1917 ("British Civilians From Ruhleben", p.6). Marcus H. Du G. Pearson's signature was recorded by fellow internee Christopher Cornforth, in an autograph book now held at the Imperial War Museum. Pearson was interned in the Barrack XI loft, and came from Underwood, Hipperholme, Halifax. Locked up in another place were Mr. Sylvester, Mr. S. Pearson, and the brothers Hickley, all of Nottingham. After being taken to Berlin, they were sent to Ruhleben, where they found the camp very rough for a time. The National Archives in London hold documents from 1915 at FO 383/22 concerning Michael Stewart Pease, interned at Ruhleben. The documents contain an enquiry from his father, Major Pease of Limpsfield, Surrey, as to whether he could be exchanged for a German prisoner wishing to return to Berlin. In the first issue of the Ruhleben Camp Magazine (March 1916, p. 31), Pease makes an appeal for the construction of garden areas throughout the camp. On April 27th 1916, Pease gave a lecture in Ruhleben on the art of dancing in the time of Elizabeth I, as part of a Shakespeare week at the camp, as noted in the Scotsman newspaper of May 15th 1916 ("Shakespeare Celebrations in Ruhleben", p.7). The Liddle Collection of Leeds University holds some items relating to Pease's stay at the camp, under reference RUH 40. These are a photocopied typescript essay regarding the Ruhleben Camp School from September 20th 1916; 13 photocopied photographs; a photocopied manuscript and typescript of recollections; photocopied Christmas cards, postcards, membership cards and miscellaneous correspondence from between 1914 and 1920; five volumes of photocopied diaries, letters and miscellaneous papers from January 1915 to July 1918; and four volumes of photocopied letters from between 1911 and 1918. The online index also tells us that Pease was in Jena learning German at the start of the war. The Imperial War Museum in London also holds various photographs from the Mrs H. Pease Collection, depicting scenes in Ruhleben from 1914-1918, with interior and exterior views, including the biology laboratory and the library, as well as group photographs and the Horticultural Society Flower Show. These can be accessed at ID:7601-13 Q 102936 - Q 102957. 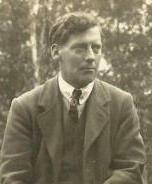 According to his granddaughter, Emma Pease, Michael Pease was believed to have been a student at the time of his internment and after the war went on to teach at Cambridge University. According to Emma's aunt he taught science classes at Ruhleben, and remained good friends with Winthrop Pickard Bell during his internment and after. The National Archives of Scotland hold a Christmas card in their collection at GD195/395, sent by Ruhleben inmate John Peddie, to the master of masonic lodge Greenock St John 175,at Christmas 1915. From Marcus Bateman's merchant seamen POW website, we learn that John was second engineer on the 'Rutland', and was originally from 8 Royton Road, Waterloo. He was one of a group of Ruhleben inmates released on March 6th 1918 to England, as noted in files at the National Archives in Kew under accession number MT9/1238. Throughout his stay he was interned in Barrack 8. One of my sons is married to a German lady, and, since the end of July last, has been residing in Germany with her parents until his own house could be got ready for occupation. On September 13 he was arrested by the police in Berlin, notwithstanding that he had obtained from the local police a permit to go there, and he wa sonly released again on October 7 upon two substantial guarantees being given for his good behaviour and a cash deposit of 20,000 marks (£1,000) being made by way of further security. On the 5th inst. my son was again arrested, and is now interned at Ruhleben, near Berlin, in the concentration camp there described by Mr. Anderson. No charges of any kind against my son were made leading to his arrest on either occasion. 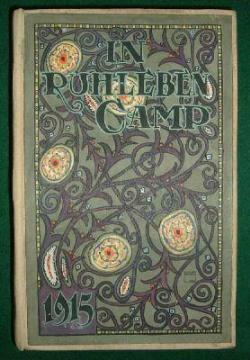 C. G. Pemberton was the editor of the Ruhleben Camp Magazine whilst interned in the camp. Pemberton was noted in issue six of the Ruhleben Camp Magazine (June 1917) as having produced the play "Eliza Comes to Stay" whilst in the camp. C.G. Pemberton was a keen amateur golfer, who first lived in the harbour town of Bremen, where he was also a member of the golf club. Later he moved to Hamburg and became a member at Golf Club Wentorf-Reinbeck east of Hamburg at least from 1913 on. He got engaged to a local German member Marie-Louise Eckstein (Lawn Tennis & Golf, Nr. 2/1913). Marie Louise was also a keen golfer who took up the game at least in 1909, 1910 she was already playing off a -18 handicap. 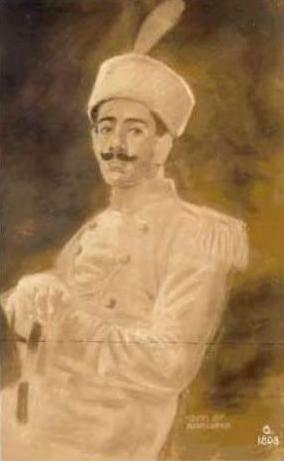 During the 1920s and 1930s C.G. Pemberton apparently stayed in Hamburg, where he worked in the insurance business. After WWI he changed the golf club and became a member at the Hamburger Golf Club. There he was one of the strongest amateur players. In 1945 Pemberton became director of the civil administration at Hamburg residing at the Europahaus at the Ballindamm. Pemberton was photographed as part of the Ruhleben Parcel Post - see Alfred Hazell King's entry for the image. Robert Herdman Pender was born in London on October 29th 1890. After attending Heriot's School in Edinburgh, he then studied modern languages at the University of Edinburgh. At Trinity College Dublin he then did a post-graduate study of George Bernard Shaw, Irish playwrights and poets. In 1914 Pender was interned at Ruhleben. He made one unsuccessful escape attempt, and was closely involved in the academic, literary and theatrical societies within the camp. He was a close friend of Alick West in the camp, with whom he collaborated on a number of academic papers. During his stay, he was noted in issue 7 of the In Ruhleben Camp magazine of having given a paper on G. K. Chesterton, one of the papers on the four "Modern English Thinkers" read in the Grand Stand Hall on August 30th 1915 (p.2. Sept. 1915). A further article entitled "What's Wrong With the World" expands on the paper as discussed by him (p.10). After his release from the camp, Pender became manager of the Abbey Theatre in Dublin. He also had several lecturing positions including Berlin University, Gottingen University (late 20s early 30s? ), and London University. In WW2 he fought as an an officer in the Canadian Army, and after the war he worked for the Control Commission for Germany (CCG), where he was responsible for drawing up the German post-war / post Nazi education system with Robert Birley (later Headmaster of Eton). He also worked for the Foreign Office with various appointments in Germany. He eventually retired in 1958 and settled in Ottawa, Canada. Many thanks indeed to Robert's son William Pender, who supplied me with the aforementioned information in April 2008. Pendleton was also recorded as a member of the Ruhleben Lancastrian Society in the Manchester Guardian of January 15th 1915 (p.12). The article is entitled "Interned in Germany: Lancashire's Civilian Prisoners: Full List of Those Detained at Ruhleben". His address was recorded as c/o G. B. Owen, 36 Derwent Road, Stoneycroft, Liverpool. Frederick William Penney is listed in the surviving register from Barrack 5 at Ruhleben (register number 2), recorded by Neville Stanley Wilkinson in approximately 1916. In the register, Penney is recorded as having been born on November 27th 1865 in Greenwich, and is described as having been an insurance agent prior to his internment. His home address was listed as Hergenrath bei Aachen. At the time the register was recorded, Penney was noted as staying in box 22. He relocated to England on January 2nd 1918. From the handbook of the Ruhleben Football Association Season 1915, Penney (Penny) is noted as being from White Colne, Essex, and as having been born in Greenwich in 1865. He worked in insurance in Heigenrath, Aachen, where he was arrested on 6 NOV 1914. After a brief period held in Aachen and Cologne, he was sent to Ruhleben, where he was interned in Barrack 5. Allan M. Pennington is listed in the surviving register from Barrack 5 at Ruhleben (register number 2), recorded by Neville Stanley Wilkinson in approximately 1916. In the register, Pennington is recorded as having been born on April 5th 1889 in Blackrod, and is described as having been a teacher prior to his internment. His home address was listed as 366 Limefield, Bury, Lancashire. At the time the register was recorded, Pennington was noted as staying in loft A, having transferred there from Barrack 12 on May 30th 1915. Pennington was recorded as a member of the Ruhleben Lancastrian Society in the Manchester Guardian of January 15th 1915 (p.12). The article is entitled "Interned in Germany: Lancashire's Civilian Prisoners: Full List of Those Detained at Ruhleben". In the seventh issue of In Ruhleben Camp (Sep 1915, p.18) Pennington is noted as "a practical engineer and teacher at Technical College". Between November 12th 1917 and January 24th 1918, Pennington spent some time being treated at the Lazarett. He relocated to Holland on April 25th 1918. Pennington was noted in issue six of the Ruhleben Camp Magazine (June 1917) as having satisfied the examiners at the London Matriculation Examination, held in the camp in December 1916. "Frederick Beaconsfield Pentland was born in Wolverhampton, on July 29th 1883, the youngest son of a big family who moved on to Birmingham before the turn of the century. In 1901 he was a Gun makers assistant living at home. He seems to have become involved with Football shortly after than and is said to have played for successively Small Heath, Blackpool, Blackburn, Brentford, Queen's Park Rangers, Middlesbrough, Halifax Town and Stoke (Source: Peter Seddon 2006). He Played for England in 1909, and 1914 found him ill placed, in Berlin where he was teaching football (as yet not confirmed but said to be) to a German officers Group. He was interned in Ruhleben throughout the war and was late being released, by which time he needed to recuperate. He was sent to the West Country where he met and later married his nurse, a war widow working as a VAD. 1920 found him coaching the French National Olympic Football Team who won their way to the Semi Final but declined to compete (see article below from the Fifa web site). He was then recruited ultimately by The Athletic Club, Bilbao, Spain where he spent most of the next 15 years with spells out as manager of various other Spanish teams including the Spanish national squad who were the first to beat England. He seemed to win either the Cup or the Liga most years whoever he was with. The advent of the Civil War in 1936 forced him to flee the country for England with his wife and daughter. Various minor roles in Football and sports management in England followed with comparative anonymity, broken only by occasional sightings at honoured guest appearances in West Brom and in Spain. A statue of "Bonbin' (the Bowler hat) as he was called still stands in Athletic Bilbao's Ground, where his birthday is celebrated annually. Fred passed away on 16th March 1962 and is buried at Lytchett Matravers, Dorset." Pentland was noted as playing on the England side, led by Steve Bloomer, in a mock international between England and the Rest of the World on May 2nd 1915. Kick off took place at 4.30pm, and a document with the teams listed was recently discovered amongst some Foreign Office files by the National Archives, in November 2005. It further lists Pentland as the chairman of the Ruhleben Football Association. A souvenir booklet by Pentland and Cameron was created in 1915 to refelct the proceedings of the last Ruhleben football season, and was briefly commented on, favourably, in the seventh issue of In Ruhleben Camp (Sep. 1915, p. 7). The same issue saw a letter penned by him inviting readers to take part in a competition entitled "Who are the Best Footballers in the Camp?" (p. 47). In addition, Pentland was noted in the Scotsman newspaper of January 10th 1916 (p.10) as being a professional footballer interned at Ruhleben. He became a regular contributor of football articles to the Ruhleben Camp Magazine. Pentland was noted in the fifth issue of the magazine (Christmas 1916, p.58) as having played for the winning Cameron's XI side against Brearley's XI on October 7th 1916. The score was 4-2 to the Cameron team. Pentland was thanked for articles written for the Ruhleben Camp Magazine by its editor, C. G. Pemberton, in the same issue (p.62). The Scotsman newspaper of March 18th 1918 noted that Pentland was still imprisoned at the camp ("Kicked and Treated Like Dogs", p.3). An image of Pentland with the team that played at Steve Bloomer's farewell match in March 1918 can be viewed online at Steve Bloomer's Farewell Match. Pereira was noted in The Times of December 8th 1915 as having been one of the 160 prisoners released from Ruhleben on the previous day who had travelled by train to Flushing ("Returning Civilians" p.9, col.F). H. Perkins has been identified from an envelope dated October 15th 1915, and posted on eBay in February 2007. The envelope tells us he was resident at Barrack 5 Box 17. William J. Perkins is listed in the surviving register from Barrack 5 at Ruhleben (register number 2), recorded by Neville Stanley Wilkinson in approximately 1916. In the register, Perkins is recorded as having been born on Mau 31st 1890 in Burntwood, Lichfield, and is described as having been a teacher prior to his internment. His home address was listed as 58a Coleham, Shrewsbury. At the time the register was recorded, Perkins was noted as staying in box 25, having transferred there from Barrack 12 on November 13th 1915. he relocated to Holland on April 25th 1918. The National Archives in London hold records from 1915 at FO383/76 regarding Arthur Perlstein, interned as a civilian prisoner at Ruhleben, concerning the destruction of his property at Durban during anti-German riots, and enquiries regarding the nationality of his child and compensation for his losses. M. Perrot was noted in issue six of the Ruhleben Camp Magazine (June 1917) as having produced the play "La Belle Aventure" whilst in the camp. Perrot was made fun of in a sketch in the fifth issue of the Ruhleben Camp Magazine (Christmas 1916, p.37), when it was suggested that after the war, he should be "gagged at last". 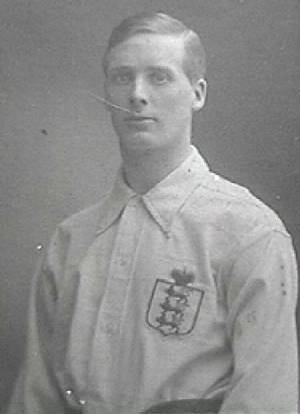 Perry was noted as playing on the England side, led by Steve Bloomer, in a mock international between England and the Rest of the World on May 2nd 1915. Kick off took place at 4.30pm, and a document with the teams listed was recently discovered amongst some Foreign Office files by the National Archives, in November 2005. Perry was also noted in the second issue of the Ruhleben Camp Magazine (April 1916, p. 29) as having been a member of a football team led by John Cameron, which defeated an opposing side led by Steve Bloomer on March 3rd 1916. Perry was further listed in the fifth issue of the Ruhleben Camp Magazine (Christmas 1916, p.58) as having played for the losing Brearley's XI side against Cameron's XI on October 7th 1916. The score was 4-2 to the Cameron team. The National Archives in London hold documents from 1915 at FO383/25 relating to Guy de Petard, an inmate at Ruhleben. Sam Peter, Bar 13, laundry man. Arthur Richard Peters is listed in the surviving register from Barrack 5 at Ruhleben (register number 2), recorded by Neville Stanley Wilkinson in approximately 1916. In the register, Peters is recorded as having been born on September 30th 1891 in North Walsham, and is described as having been a student prior to his internment. His home address was listed as West Carr, Attleborough, Norfolk. At the time the register was recorded, Peters was noted as staying in loft A. From the handbook of the Ruhleben Football Association Season 1915, Peters is noted as being from Attleborough, Norfolk, and as having been born in North Walsham in 1891. He was a student in Worms, where he was arrested on 5 AUG 1914. After a brief period held in Sennelager and Barmen, he was sent to Ruhleben, where he was interned in Barrack 5. Peters is further noted in the second issue of In Ruhleben Camp (June 1915, p.15) as having scored 50 for Barrack 5 in a cricket match between Barracks 5 and 6, in the second division of the Ruhleben Cricket League. The National Archives in London hold documents from 1915 at FO383/76 regarding Peters, namely an enquiry from his mother, Ellen Peters of Attleborough, Norfolk, regarding the recovery of his lost luggage. Charles Petersen was a Swedish seaman working on a Wilson liner, which was interned at Hamburg, and its crew sent to Ruhleben. 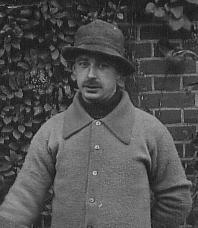 Petersen was released from the camp in February 1915, returning to Hull after his release. An article in the Scotsman from 8/2/1915 describes his recollections of life in the camp, which he found unbearable. Geoffery Charles Pether is listed in the surviving register from Barrack 5 at Ruhleben (register number 2), recorded by Neville Stanley Wilkinson in approximately 1916. In the register, Pether is recorded as having been born on March 9th 1897 in London, and is described as having been a student prior to his internment. His home address was listed as 13 Craven Road, Harlesden, London. At the time the register was recorded, Pether was noted as staying in R.1. He later transferred to Barrack 8 on May 6th 1918. My father was born on 9th March 1897 in, I think, Cranleigh Gardens, London. His father was Alfred James Brown Pether and his mother Sarah Sophia (Sally) Harding. I don't know where my father went initially to school but he did eventually go to St Paul's where he did moderately well. He seemed to have a particular bent for languages so this is probably why he was sent to Heidelberg College in Germany. Geoffrey wrote to his parents 1914 that it seemed to him that Germany was determined to go to war. he thought it might be better for him to return to England but was very worried about the waste of the fees at his school and particularly about his laundry. Things became confused, and with nobody's particular fault, when war was declared, he was trapped and eventually stuck in a Prisoner of War camp at Ruhleben, which is near Spandau, south of Berlin, as an internee. There he remained for the whole four years of the war together with up to 5000 other internees and Prisoners of War which included some of the brightest of people. Two of the inmates eventually became Nobel Prize winners, there were lectures in at least fifteen languages and a whole host of subjects. he learned to use his quick wits with foil epee and sabre. But the internment took its toll. What must have softened the experience sent by Alan Harding, my father's couisn, later known as John harding, the eventual Field Marshall. They were extraordinarily sensitive and cheering letters. This must have come from the several years that John Harding had lived with Geoffrey and his parents as little boys in Barnet. One story is that somehow they managed to obtain a toy bronze cannon. They worked out how to fire ball bearings down Barnet Hill - then it was fields. If they got a MOO from the nearest cow they got a point! Geoffrey eventually passed away after a heart attack in Bath Hospital on August 12th 1970. many thanks indeed to John for his great efforts in supplying not only the above (and in a much fuller form) but also many documents from his time in Ruhleben, which will be uploaded at a future point, as time allows! 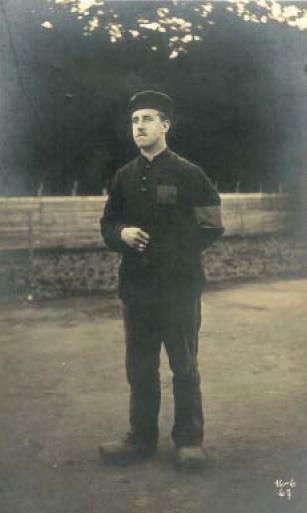 "The weather was perfect, when hartly, the referee, started the game before a 'gate' of more than 3000 spectators. Bar.8 commenced as though they were going to win comfortably. For the first 20 minutes there was only one team in it, and that was 8. Kastner in goal for 8 only had one kick during this period; in fact 8 was so superior that the match promised to be uninteresting in consequence. Only the magnificent defence of the elder Wright and Petrie saved 20. In the last fifteen minutes of the first half 20 began to havea little more of the game,but 8's defence was equal to all demands, and half time came with no goals scored. On the re-start 20 played like a different team, and Kastner had almost as much work as Petrie had had in the first half. It seemed certain that time would come without a score, when, five minutes from the close (we play 35 minutes each way), a mistake by 8's defence enabled Mills to score at close range for 20. A wild cheer from the specatators greeted this success, because 8 were generally expected to win, and a British crowd dearly loves to see a weaker side conquer. However, the game was not finished, for two minutes before time Nappin got through for 8 and equalised. Again there was a mighty cheer as a tribute to 8 for pulling off what appeared to be a forlorn hope, with a goal against them and so little to go. Extra time, ten minutes each way, was ordered; but the players of the both teams had expended their strength and energy in the ordinary portion of the game, and they could only just last the time out without either side adding to the score." Barrack 20 won 3-0 in the replay, three days later. From the handbook of the Ruhleben Football Association Season 1915, Joseph Petrie is noted as being from 3 Hilltown, Dundee. He was a seaman, captured by the S. M. S. Augsburg on 7 SEP 1914, and sent to Ruhleben, where he was interned in Barrack 6. Reginald Julius Pettitt is listed in the surviving register from Barrack 5 at Ruhleben (register number 2), recorded by Neville Stanley Wilkinson in approximately 1916. In the register, Pettitt is recorded as having been born on December 9th 1893 in London, and is described as having been a clerk prior to his internment. His home address was listed as 26 Thane Villas, London, N. At the time the register was recorded, Pettitt was noted as staying in box 10. Pettitt is also recorded as having spent some time in the Schonungsbaracke between April 6th 1918 and April 10th. From the handbook of the Ruhleben Football Association Season 1915, Pettitt is noted as being from 26 Thane Villas, north London, and as having been born in Greenwich in 1891. He worked as a clerk in Wesel and was arrested on 12 AUG 1914. After a brief period held in Sennelager, Crefeld and Duisburg, he was sent to Ruhleben, where he was interned in Barrack 5. A bound photocopied book of poetry owned by inmate Terence Philip (possiblty written by him) was deposited with the Liddle Collection at Leeds University by Mrs E. Broughton-Addersley, and is held at RUH 41. A copy is also held at the Imperial War Museum in London, at ID:7946. Another Philips, Christian name unknown, is noted as having been in the Teahouse on a letter dated 20 JAN 1916, held by Dr. Manfred G. Heber of Grand Canaria (with thanks to Dr. Heber). Moreton Phillips was named in an undated Foreign Office document contained within file FO 369/710, entitled Russenlager Ruhleben (Ruhleben Russian Camp), implying it was compiled at the outbreak of internment in 1914. He was described as a 32 year old language teacher who had been working in Berlin. Phillips was further listed in another file in FO 369/710 dated 11 OCT 1914. The list was communicated to the Foreign Office by a Nurse Coe (with thanks to Simon Fowler). The National Archives in London hold documents from 1915 at FO 383/21 concerning a possible exchange involving Ruhleben internee Mr. St. G. H. Philips, former bank assistant in a Hamburg bank. Many thanks to Richard Phillips with regard to his grandfather, of the same name, supplied in August 2007. From an inscription inside a leather bound copy of some Ruhleben magazines, Richard is noted as having been interned in Barrrack 8. He was the second mate on the merchant ship 'Duns Law', and was arrested in Hamburg at the outbreak of the war. Marcus Bateman's index of Merchant Seamen website Richard as born in 1892 and with his home address as 18 Molyneux Road, Waterloo, Liverpool. The Imperial War Museum holds a small album of photographs, drawings and other paper memorabilia relating to the internment of W. G. Phillips in Ruhleben internment camp - ID number: 9475 Misc 8 (167). C. J. Pickering was recorded as a member of the Ruhleben Lancastrian Society in the Manchester Guardian of January 15th 1915 (p.12). The article is entitled "Interned in Germany: Lancashire's Civilian Prisoners: Full List of Those Detained at Ruhleben". His address was recorded as Whitecroft Billinge, Blackburn. The National Archives in London hold documents from 1916 at FO383/207 regarding advice given to Mr. E. Pickering about sending money to his son, Cyril Pickering, via Holland to Ruhleben. Edgar Pickering is listed in the surviving register from Barrack 5 at Ruhleben (register number 2), recorded by Neville Stanley Wilkinson in approximately 1916. In the register, Pickering is recorded as having been born on May 10th 1894 in Hagenau, Elsass, and is described as having been a civil engineer prior to his internment. His home address was listed as Schosselweg, Hagenau, Elsass. At the time the register was recorded, Pickering was noted as living in box 26, having transferred there from Barrack 1 on June 21st 1918. Pickering shared the box with his brother, Harold, and father, John. A Pickering from Barrack 5 is also recorded as having spent some time in the Schonungsbaracke between September 2nd 1918 and September 22nd, although there is no indication as to which of the three members of the Pickering family this was. Harold Dean Pickering is listed in the surviving register from Barrack 5 at Ruhleben (register number 2), recorded by Neville Stanley Wilkinson in approximately 1916. In the register, Pickering is recorded as having been born on December 8th 1897 in Hagenau, Elsass, and is described as having been a student prior to his internment. His home address was listed as Schosselweg, Hagenau, Elsass. At the time the register was recorded, Pickering was noted as living in box 26, having transferred there from Barrack 1 on June 21st 1918. Pickering shared the box with his brother, Edgar, and father, John. John George Pickering is listed in the surviving register from Barrack 5 at Ruhleben (register number 2), recorded by Neville Stanley Wilkinson in approximately 1916. In the register, Pickering is recorded as having been born on May 29th 1878 in Batley, Yorkshire, and is described as having been a manufacturer prior to his internment. His home address was listed as Schosselweg, Hagenau, Elsass. At the time the register was recorded, Pickering was noted as living in box 26, having transferred there from Barrack 1 on June 21st 1918. Pickering shared the box with his two sons, Edgar and Harold. John Barron Piggott was interned at Ruhleben for the whole of the First World War. A postcard held by his grandson Peter Fitch tells that he was resident in Barrack 2 Box 14 on December 12th 1917. Piggott was born at Inveraray Castle in Scotland where his Father was chief coachman to the Duke of Argyle. At the outbreak of the 1914-18 war, John Piggott was working for a Count Reventlow at Emkendorf on the Danish/German borders. He was working as a groom / driver. The Red Cross arranged for his wife Elizabeth and his two daughters, Elsie and Edith (my Mother) to return to London, England while John was sent to Ruhleben. During his time at Ruhleben, he talked about having a friend in the camp, a jockey called Freddie. After the war he returned to England to be reunited with his family. He was out of work for some time, doing odd jobs and ocassionally driving. In the 1920's he worked as a driver for an English business man in Romania for 3-4 years and he took his family with him. In the 1930's he then worked as a bus conductor for London Transport. Many thanks to John's grandson Peter Fitch for supplying the above information in February/March 2006. As well as the aforementioned postcard, Peter also has in his possession an Omega pocket watch belonging to his Grandfather which has engraved on the back 'Prisioner of War - Ruhleben' and the dates 1914- 1915. The Times of February 5th 1919 also tells us that the Crown Princess of Sweden returned on February 4th to the Ruhleben Exhibition, and received from former inmate H. Pimm an original poster of "A White Man", one of the plays produced in the Ruhleben Grand Stand Theatre ("Court News", p.11, col. B). Born the 10th of February 1895 at Vale of Health Studios, Hampstead Heath, London NW, he was an artist, he was in Antwerp Belgium, during the Great War, he convinced the Germans that he was an American, until 1916 when the American declared war on Germany and was interned at Ruhleben Camp, he was also a commercial artist. He prepared action pictures to Daily Mirror; there was a story that he was dismissed for drawing a portrait of a famous Military General with his medals drawn back to front. He died on the 14th of February 1957 at St. Charles Hospital Kensington, London, his niece Jane Francis (Styles) Boyce was present at the death, she lived at 7 Stanford Close, Ruislip Middx. 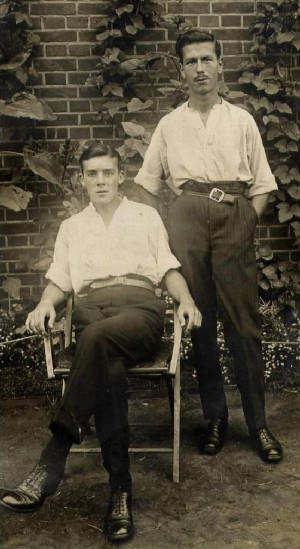 From a Christmas card dated 1917 in Victor's possession, it is known that Harry was interned in Barrack 10, loft 1. Walter Pittinger was one of nine men over the age of 55 released from Ruhleben at the beginning of May 1916, as noted in the Times of May 9th 1916 ("British Prisoners from Germany", p.5, col.F). The article notes that Pittinger had been arrested six months earlier in Brussels. Charles Planner was a horse trainer interned at the beginning of the war in 1914. The Scotsman newspaper noted on 30/11/1914 (p.9) that he had been released from the camp two days prior, on the 28th. Planner was released because many thoroughbreds had been left on their own in their stables, and had soon gotten out of control. The Germans therefore deemed it wiser to release their trainers than to have them remain interned. John Harold Platford was appointed to the committee of the camp's Finance Department in March 1915, as recorded in the Scotsman on 29/3/1915 (p.8) and the Times on 29/3/1915 ("More and Better Food at Ruhleben" p.4 col A). The department's remit was to control and administer all camp funds and distribution of monetary relief. The National Archives in London also hold documents from 1915 at FO383/73 regarding the transfer of the power of attorney for transmission to his bankers. Platford was also noted as a chartered accountant on the camp's Finance Committee in a letter he co-authored for the seventh issue of the In Ruhleben Camp magazine (Sep 1915, p.43), regarding the committee's report on the accounts up to June 30th 1915. Platford was sketched by C. M. Horsfall on July 31st 1916 for the fourth issue of the Ruhleben Camp Magazine (August 1916, p.8). Platford also had the 'honour' to be lampooned by way of a monogram drawn in the sixth issue of the Ruhleben Camp Magazine (June 1917), by artist CMAW. After the war, Platford was noted in The Times of November 9th 1931 as being one of the former inmates of Ruhleben present at a dinner meeting held in November 1931 by the Ruhleben Association, which was held to discuss an appeal to the House of Lords for the group's claims for compensation ("Reunion of Ex-Ruhleben Prisoners", p.17, col.D). Mr. A. W. M. Platow (Bar 2, Box 25) informs us that he is willing to place his knowledge of German legal matters at the disposal of any who need such assistance free of charge. Sam Platt is listed in the surviving register from Barrack 5 at Ruhleben (register number 2), recorded by Neville Stanley Wilkinson in approximately 1916. In the register, Platt is recorded as having been born on March 5th 1884 in Mirfield, Yorkshire, and is described as having been a dry works manager prior to his internment. His home address was listed as 12 Thornfield Avenue, Waterfoot, Lancashire. At the time the register was recorded, Platt was noted as staying in box 8. Platt was recorded as a member of the Ruhleben Lancastrian Society in the Manchester Guardian of January 15th 1915 (p.12). The article is entitled "Interned in Germany: Lancashire's Civilian Prisoners: Full List of Those Detained at Ruhleben". Henry Emil Player is listed in the surviving register from Barrack 5 at Ruhleben (register number 2), recorded by Neville Stanley Wilkinson in approximately 1916. In the register, Player is recorded as having been born on September 29th 1888 in Swansea, and is described as having been a merchant prior to his internment. His home address was listed as Eversely Road, Swansea. At the time the register was recorded, Player was noted as staying in box 15, having transferred there from Barrack 4 on November 27th 1916. From the handbook of the Ruhleben Football Association Season 1915, Edward L. Pleninger is noted as being from 5 Osborne Villas, Brighton, and that he was born in Bolton in 1890. He was a hotel cashier and was arrested in Frankfurt on 6 NOV 1914. After a brief period held in Frankfurt and Giessen, he was sent to Ruhleben, where he was interned in Barrack 4. A Mr. Plowman is noted in IRC issue 7 of having given a lecture on Mexico on August 28th 1915. Paul Podenbra was noted in Barrack 6 Box 5 on correspondence dated 2 DEC 1915 as held by Dr Manfred G. Heber in Grand Canaria (with thanks to Dr. Heber). Paul Adolph Poingfurst is listed in the surviving register from Barrack 5 at Ruhleben (register number 2), recorded by Neville Stanley Wilkinson in approximately 1916. In the register, Poingfurst is recorded as having been born on December 18th 1897 in Manchester, and has no description listed for his occupation prior to his internment. His home address was listed as 92 Heywood Street, Moss Side, Manchester. At the time the register was recorded, Poingfurst was noted as staying in Loft B. From the handbook of the Ruhleben Football Association Season 1915, Poingfurst is noted as being from 92 Heywood Street, Moss Side, Manchester, and as having been born in Manchester in 1897. He was a student in Schmollen, and was arrested on 30 AUG 1914. After a brief period held in Sachsen-Altenburg, Smollen and Alten Grabow, he was sent to Ruhleben, where he was interned in Barrack 5. Poingfurst was recorded as a member of the Ruhleben Lancastrian Society in the Manchester Guardian of January 15th 1915 (p.12, listed as A. Poingfurst). The article is entitled "Interned in Germany: Lancashire's Civilian Prisoners: Full List of Those Detained at Ruhleben". Poingfurst is also recorded as having spent some time in the Schonungsbaracke between July 6th 1918 and July 9th. Poingfurst was noted in the fifth issue of the Ruhleben Camp Magazine (Christmas 1916, p.58) as having played for the losing A side in a second division match between the A team and the B team on October 3rd 1916. The score was B: 4 to A: 1. My sister and I have been trying to find out more about our family history. We came across your website after having googled the maiden name of our paternal grandmother. Her brother was Paul Adolph Poingfurst and we were interested to find out more about him. We believe he must have returned to the UK at some time as my father remmebers his Uncle Paul - probably from when he (Paul) was in his early fifties; he was not in good health. Major Pond was noted as an inmate at Ruhleben in the essay written by Francis Gribble, entitled "Leaves From a Ruhleben Notebook". "We discovered a Major Pond, who undertook to arrange a series of lectures.."
The National Archives in London hold documents from 1915 at FO383/26 concerning Arthur Gordon Ponsonby, namely an enquiry from his mother, Madame de Pitard, an Englishwoman living in Switzerland. Ponsonby is also noted in the second issue of In Ruhleben Camp (June 1915, p.14) as having played for the Varsities team against the Rest of Ruhleben, in the Ruhleben Cricket League. Ponsonby is further recorded in the fourth issue of the magazine (August 1916, p.38) with an average cricket score of 55.37 runs per inning, having scored 443 runs in total for 8 innings in several July matches. Ponsonby was thanked for articles written for the Ruhleben Camp Magazine by its editor, C. G. Pemberton, in the fifth issue (Christmas 1916, p.62). The Liddle Collection of Leeds University holds several items relating to Ponsonby's stay at Ruhleben, under reference RUH 42. These are a Christmas card from 1914); a publication, 'The Ruhleben Bye-Election' from 1915; a tercentenary Shakespeare Festival song-sheet from April 26th 1916; two photographs from December 12th 1917; a leaflet regarding standard parcels of food; two pamphlets 'The Ruhleben Prisoners: A Reasoned Plea for Immediate Release, Pamphlet No. 2'; an article 'Ruhleben - The Third Anniversary', reprinted from 'The Daily Mail' of November 6th 1917; Issues No. 1 and No. 2 of 'Ruhleben Camp News' from January 1915; and extract entitled 'The Bishop of Ruhleben' from 'Land and Water', dated December 4th 1915; two letters from the 'Ruhleben Prisoners' Release Committee' dated April 19th and 20th 1918; a cricket scorecard; a typescript song 'When Are We Going Home? '; a pamphlet 'Further Correspondence Respecting the Conditions of Diet and Nutrition in the Internment Camp at Ruhleben and the Proposed Release of Interned Civilians', from July 1916; a manuscript of recollections; an open letter 'The Release of Ruhleben Prisoners' dated February 8th 1917; a letter from the Foreign Office dated August 8th 1916; and three press cuttings from October 30th 1915 to June 18th 1916. The online index tells us that Ponsonby was interned in Barrack 3. John Porter, of 60 Evelyn Street, Liverpoool, was a fireman on board the Borderland, which was captured by a German torpedo boat and escorted into the port of Hamburg, from where after an initial stay on board their vessel, they were removed and sent to Ruhleben. Porter was released in January 1918, and notice of his release appeared in the Scotsman newspaper on January 9th 1918 ("Lfe in Ruhleben - Stories of Returned Civil Prisoners", p.5). Edgar Pottage was in Ruhleben, captured with the crew of the ss Hull, an Ellerman Wilson ship from Hull. police called at the house with a warrant for his arrest, for not having responded to his call up for service! Ellerman Wilson seamen to Lady Nunburnholme for her thanks in sending them parcels. Pottage is also noted on a list of prisoners of war on a document entitled 'Men in Englander Lager, Ruhleben', held by Hull Local Studies Library (provisional catalogue entry: Hohenrein Collection F 10b), supplied by senior local studies librarian David Alexander Smith in July 2008, for which I am grateful. The document notes that he was a merchant seaman on board the S. S. Hull, and interned in Barrack 8. Pottage is also noted as being in Barrack 8 on a postcard dated 5 MAY 1917 to Fleet, Hants, as held now by Dr. Manfred G. Heber of Grand Canaria (with thanks to Dr. Heber). Jack Poulonin was named in an undated Foreign Office document contained within file FO 369/710, entitled Russenlager Ruhleben (Ruhleben Russian Camp), implying it was compiled at the outbreak of internment in 1914. He was described as a 20 year old waiter and previously at work in Berlin. It seems likely that he was misrecorded as Pouline in another document in FO 369/710, dated 11 OCT 1914. The list was communicated to the Foreign Office by a Nurse Coe (with thanks to Simon Fowler). From the handbook of the Ruhleben Football Association Season 1915, Horace Edward Poulson was noted as being from 38 De Grey Street, Hull, and as having been born in Hull in 1897. He worked as an apprentice seaman and was arrested in Hamburg on 4 AUG 1914. He was sent to Ruhleben, where he was interned in Barrack 8. H. Poulson was noted on a list of prisoners of war on a document entitled 'Men in Englander Lager, Ruhleben', held by Hull Local Studies Library (provisional catalogue entry: Hohenrein Collection F 10b), supplied by senior local studies librarian David Alexander Smith in July 2008, for which I am grateful. The document notes that Poulson was a merchant seaman on board the Dartwen, and interned in Barrack 8. W. Poulson was recorded as a member of the Ruhleben Lancastrian Society in the Manchester Guardian of January 15th 1915 (p.12). The article is entitled "Interned in Germany: Lancashire's Civilian Prisoners: Full List of Those Detained at Ruhleben". His address was recorded as 72 Pen Street, Bolton. W. Poulter is noted on a list of prisoners of war on a document entitled 'Men in Englander Lager, Ruhleben', held by Hull Local Studies Library (provisional catalogue entry: Hohenrein Collection F 10b), supplied by senior local studies librarian David Alexander Smith in July 2008, for which I am grateful. The document notes that Poulter was a merchant seaman on board the S. S. Castro, and interned in Barrack 5. Joseph Powell became the Captain of the Camp at Ruhleben, and helped to set about its civilian infrastructure so that its inmates could try to lead as normal a life as was possible in the circumstances. When he created the committee structure in March 1915, he took responsibility himself for the Kitchen Department, acting as its chair, as reported in the Scotsman of 29/3/1915 and the Times on 29/3/1915 ("More and Better Food at Ruhleben" p.4 col A). The department's remit was to control the kitchens and all questions regarding the food of the prisoners. A document with the teams listed for a mock international between England, led by Bloomer, and the Rest of the World, led by Cameron, on May 2nd 1915, was recently discovered amongst some Foreign Office files by the National Archives, in November 2005. It further lists Powell as the honorary president of the Ruhleben Football Association. Each horse box (stall) was about 11 feet square and housed 6 men. In the lofts the men were packed shoulder to shoulder around the walls and down the center. Mr. Powell (the elected prisoner-captain) recalls, "We were put in stable #10. This stable, designed to accomodate 27 horses, housed 365 men. We shared two cold water taps and fifteen earthenware bowls. There was no arrangement at all for heat, and the only lighting was hung in the corridors." The Scotsman newspaper of June 26th 1915 carried a letter from Powell to the Central News agency, in which he set the record straight that there had not in fact been fifty cases of smallpox in the camp, as had been reported in some quarters of the press, and that there had only been a few cases of German measles ("No Smallpox at British Prisoners Camp", p.14). A further note from Powell in the Scotsman of July 16th 1915 gave the news that the Germans had once more allowed prisoners to recieve chocolate, biscuits and cakes in the prisoners' food parcels ("British Civilian Prisoners in Germany", p.4). An article from the Scotsman on October 27th 1915 ("Ruhleben Camp - Success of Civil Administration", p.9) gave an account of how Powell ceased to be captain of Barrack 10 on September 15th 1915, in order that he could concentrate fully on his role of Captain of the Camp, the Germans having decided to try civilian administration in running the camp. W. W. Williams replaced Powell as captain of Barrack 10. The seventh issue of In Ruhleben Camp contains a two page letter from Powell to all prisoners defending the camp's administration of funds (Sep 1915, p.20-21). The National Archives in London hold documents from 1915 at FO383/40 regarding the officers and committees appointed by Powell. At FO383/62, further documents are to be found, namely correspondence from J. Powell, Captain of the Camp, to the British Prime Minister. Mr. Powell, the Captain of Captains, must have worked quite as hard in the camp as he ever needed to work outside it. We owed him, among other things, the introduction of the cinematograph, and no doubt it was largely through his energy that the prisoners came to take over the management of practically everything in the camp, from the kitchen to the canteen. The Times on January 4th 1919 records Powell's presence at the Ruhleben Exhibition at the Central Hall of Westminster ("Life in Ruhleben", p.11, col. F), and notes many anecdotes given by Powell concerning his internment. Powell was also present at the Exhibition on February 10th 1919, where he was one of the prisoners who entertained the King and Queen on a Royal visit to see for themselves what the civilians had endured, and as recorded in The Times of February 11th 1919 ("Ruhleben Exhibition", p.9, col. F). 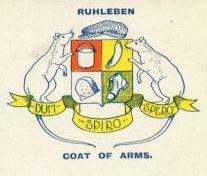 Powell, along with Anderson, presented the King with a Union Flag which contained the Ruhleben coat-of-arms (two rats supporting a shield, with a German sausage and other appropraite emblems), the names of many of the prioners, and the inscription "Although unable to fight for our King and country on the battlefield, we endeavoured to maintain the British ideal of patriotism, patience, courage, and usefulness through four years". On November 28th 1919, the Times carried an advert for Powell's book, "The History of Ruhleben", co-written with Francis Gribble (p.18, col. A). Powell died in January 1925, with his obituary carried in The Times on the 27th ("Camp Captain at Ruhleben: Mr. Joseph Powell Dead", p.13, col. F). A funeral service was held for him in the Anglican Church of St. George in Berlin, his body was then repatriated to England, and he was subsequently buried in Highgate Cemetery, North London. William Thomas Powell is listed in the surviving register from Barrack 5 at Ruhleben (register number 2), recorded by Neville Stanley Wilkinson in approximately 1916. In the register, Powell is recorded as having been born on September 19th 1888 in Birmingham, and is described as having been a designer prior to his internment. His home address was listed as 68 Landsdowne Street, Birmingham. At the time the register was recorded, Powell was noted as staying in Loft B. From the handbook of the Ruhleben Football Association Season 1915, Powell is noted as being from Lansdowne Street, Birmingham, and as having been born in Birmingham in 1888. He worked as a designer in Saarbrucken, where he was arrested on 5 AUG 1914. After a brief period held in Saarbrucken, Magdeburg and Alton-Grabow, he was sent to Ruhleben, where he was interned in Barrack 5. In 1918 Powell decorated a specially bound volume containing every issue of In Ruhleben Camp, the volume being the property of another inmate, Robert L. Anderson, of Barrack 11, box 27. The decoration to the volume was done as a label which was applied after the issues were bound together in the volume. The volume was put up for sale on E-Bay in April 2006 for £1500, with Powell's name incorrectly listed as "Dowell" in the description of the sale, due to his signature on the front being hard to make out from the design within which it was incorporated. The Times of February 5th 1919 also tells us that the Crown Princess of Sweden returned on February 4th to the Ruhleben Exhibition, and purchased 40 paintings, with the painters selected including Powell ("Court News", p.11, col. B). Printed below is one of Powell's drawings, entitled "In the Passage". John Power was recorded as a member of the Ruhleben Lancastrian Society in the Manchester Guardian of January 15th 1915 (p.12). The article is entitled "Interned in Germany: Lancashire's Civilian Prisoners: Full List of Those Detained at Ruhleben". His address was recorded as 51 Elford Street, Seedley, Salford. John Power was further recorded in The Times as being about to give a concert at the Ruhleben Exhibition on Friday, February 7th, with fellow former Ruhleben musicians, all of whom had been professional musicians captured in Bayreuth. The article appeared on January 30th 1919 in the Times ("Ruhleben Exhibition", p.11, col. F). Power was also present at the Exhibition on February 10th 1919, where he was one of the prisoners who entertained the King and Queen on a Royal visit to see for themselves what the prisoners had endured, and as recorded in The Times of February 11th 1919 ("Ruhleben Exhibition", p.9, col. F). Power played the piano to a chorus of prisoners singing The Ruhleben Song. Little is known of Alfred Preedy, other than the fact that he was interned in Barrack 15 at Ruhleben, as evident from two postcards held by Vincent Dubber, which were addressed to a Richard Wakeham in Durban Road, Liscard, Cheshire at Christmas 1916 and 1917. One of the cards lists Alfred's address as "Baracke Nr 15 the 14/XII". Many thanks to Vincent Dubber for supplying this information in June 2007. George Pressman is listed in the surviving register from Barrack 5 at Ruhleben (register number 2), recorded by Neville Stanley Wilkinson in approximately 1916. In the register, Pressman is recorded as having been born on November 5th 1877 in Stratford, and is described as having been an engineer prior to his internment. His home address was listed as 55 Salcombe Road, Leyton, Essex. At the time the register was recorded, Pressman was noted as staying in loft B. A receipt held by Dr. Manfred G. Heber in Grand Canaria, dated 14 NOV 1914, lists Pressman in Loft B also. (With thanks to Dr. Heber). The National Archives in London hold documents from 1915 at FO383/27 regarding enquiries from the British Red Cross and Order of St John about Matthew Stewart Prichard. FO383/69 also holds papers on the conditions at Ruhleben, including criticisms from Louis Mallet, with a copy of a letter from M. S. Prichard. Mr. Prichard was also noted by Francis Gribble in his essay entitled "Leaves From a Ruhleben Notebook". "At the head of it (university) was the Science and Arts Union, organised by Mr. Hattfield, a distinguished chemist, with whom were associated, among others, Professor Delmer, whom I have already mentioned, Mr. Klingender, the Curator of the Gosling Museum, and my friend Mr. Prichard - a society to which our own Education Office has been sending a large supply of education books." "Mr. Prichard and Mr. Oscar Magnus were taking classes in Italian." The seventh issue of In Ruhleben Camp notes that Prichard had received a letter from Sir Louis Mallett KCB Director of the British Red Cross and Order of St. John offering to meet anybody who managed to return to England from the camp at his address of 31 St. James' Square, London S.W (Sep 1915, p. 29). 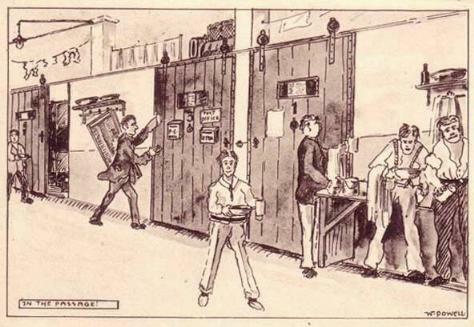 Prichard was made fun of in a sketch in the fifth issue of the Ruhleben Camp Magazine (Christmas 1916, p.37), when it was suggested that after the war, he should become a music hall attendant. Prichard died in October 1936, and glowing tributes to him and the work that he carried out in Ruhleben Camp were carried in The Times of October 19th 1936 ("Mr. M. S. Prichard: A Strange, Original Personality", p. 16, col. C). The Liddle Collection of Leeds University holds a typescript of recollections of M. S. Prichard as recorded by fellow inmate W. Rawson, with manuscript notes. These are held under reference RUH 43. "It appeared that the claimant was living in Frankfort-on-Main, and in November, 1914, he was interned in Ruhleben, wher he remained until release in November, 1918..."
Pront was confirmed as an inmate from an item listed for sale on E-Bay in September 2005. An internal RXD card informed Pront, at an unknown date, that his towels were ready for collection at the special orders department. The card listed Pront in Barrack 6, Box 23. J. Prunt was one of six prisoners released from Ruhleben in October 1917, who made their way to Rotterdam to proceed to England, as reported in The Times of October 5th 1917 ("Imperial and Foreign News", p.7, col. F). Joseph William Psaila is listed in the surviving register from Barrack 5 at Ruhleben (register number 2), recorded by Neville Stanley Wilkinson in approximately 1916. In the register, Psaila is recorded as having been born on March 31st 1890 in Alexandria, Egypt, and is described as having been a clerk prior to his internment. His home address was listed as 3 Rue Henri Berge, Brussels. At the time the register was recorded, Psaila was noted as staying in box 4, having been placed there after his arrival from Berlin on January 27th 1916. Psaila is also recorded as having spent some time in the Schoningsbaracke between February 18th 1918 and February 22nd. Alfred Pullen is listed in the surviving register from Barrack 5 at Ruhleben (register number 2), recorded by Neville Stanley Wilkinson in approximately 1916. In the register, Pullen is recorded as having been born on May 25th 1883 in Bedford, and is described as having been a jockey prior to his internment. His home address was listed as Marchienne-au-Pont, Belgium. At the time the register was recorded, Pullen was noted as staying in box 7, having arrived there at October 26th 1915. Reginald George Pullen is listed in the surviving register from Barrack 5 at Ruhleben (register number 2), recorded by Neville Stanley Wilkinson in approximately 1916. In the register, Pullen is recorded as having been born on September 20th 1890 in London, and is described as having been a bank clerk prior to his internment. His home address was listed as 66 Hubert Grove, Clapham, London. At the time the register was recorded, Pullen was noted as staying in box 17. Pullen spent some time in the sanatorium between May 16th and November 24th 1917. He transferred to Barrack 16 on November 24th 1917. In a list of prisoners from the Wolf transferred to Ruhleben in A. H. F. Clarke's "To Kiel on the German Raider Wolf and Beyond", Purdom is noted as a Ruhleben prisoner from Ceylon, captured on the ship Hitachi Maru in early 1918. See entry for Alfred Henry Frank Clarke. The National Archives in London hold documents from 1915 at FO383/25 concerning Captain George N. Purdy, a merchant marine interned at Ruhleben. The documents is an enquiry from Messrs William Thomson and Company, Canadian steamship owners, requesting steps for Purdy's release. H. W. M. Purdy is noted as being in Barrack 8 Box 22 on a receipt dated 1 JAN 1916 , a copy of which is held by Dr. Manfred G. Heber of Grand Canaria (with thanks to Dr. Heber). Pyke was appointed in March 1915 to be on the committee of the Kitchen Department, as reported in the Scotsman on 29/3/1915 (p.8) and the Times on 29/3/1915 ("More and Better Food at Ruhleben" p.4 col A). The department's remit was to control the kitchens and all questions regarding the food of the prisoners. Pyke is noted as having been resident in Barrack 2 Box 3 on a letter from a St. John's Wood NW dated 24 JAN 1916, as held in the private collection of Dr. Manfred G. Heber in Grand Canaria. (Many thanks to Dr. Heber.) He was soon after sketched by C. M. Horsfall for the second issue of the Ruhleben Camp Magazine (April 1916, p.11), in which he is described as working in the "near kitchen". In which Mr. Pyke, a London man of busines, who as an inspector of the Kitchen Committee at Ruhleben visited Berlin nearly 100 times last year, reveals the present appalling condition of Germany. HODDER & STOUGHTON, Publishers, London. E.C.4. An article describing a talk given by Pyke at the Grafton Galleries on his POW experience was carried in The Times of August 21st 1918 ("Hackenschmidt's Ration Cards", p.3, col. A). Pyke also gave a slide show at a Ruhleben concert performed in the Aeolian Hall, as reported in The Times on June 23rd 1922 ("Recitals of the Week", p. 12, col. B). Many thanks to Marcus Bateman for the National Archives file (MT9/1238) showing that Pyke was released from Ruhleben on March 6th 1918, and that he had been interned in Barrack 17. 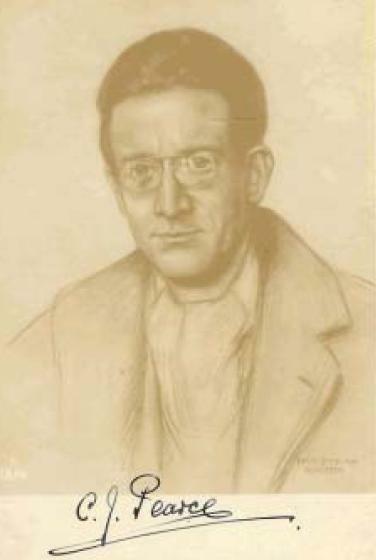 Geoffrey Pyke was a Jewish English journalist who found himself interned in Ruhleben shortly after arriving in Germany, two months after the war had started. At twenty years of age, he had travelled there on an American passport to try and obtain exclusive news coverage from Berlin as a war correspondent for the London Daily Chronicle. The National Archives in London hold documents from 1915 at FO383/68 regarding conditions at Ruhleben, and a criticism by Pyke of Mr. Minot's favourable report on the camp, with a character sketch of German officials in charge. Pyke successfully attempted an escape from the camp in 1915, with fellow inmate Edward Falk, and upon his return to Britain wrote up his memoirs in the book "To Ruhleben and Back", with his story also covered in Blackwood's Magazine. The Scotsman newspaper of July 26th 1915 carried an article about Pyke's arrival in Amsterdam on July 24th, just after his escape, along with fellow inmate Edward Falk ("Adventurous Journey from Ruhleben", p.8). A further article on July 27th gave readers a lot more detail of their escape effort ("Escape from Ruhleben - British Civilians Trying Journey", p.3). The Manchester Guardian of July 26th 1915 covered Pyke's escape in the article "Englishmen Escape from German Camp" (p4), whilst the Times of April 4th 1916 later carried an advertisement for Pyke's book To Ruhleben - And Back, priced 4s. 6d. (p. 4, col. A).